Your robot friends can help you to deliver a special 'Well Done!' 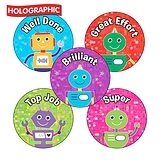 to your pupils with these themed reward certificates. 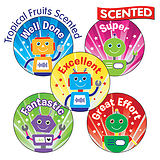 Your pupils will love the robot design of the certificate, with it's bright colours and cute characters and the yummy tropical fruit scent.